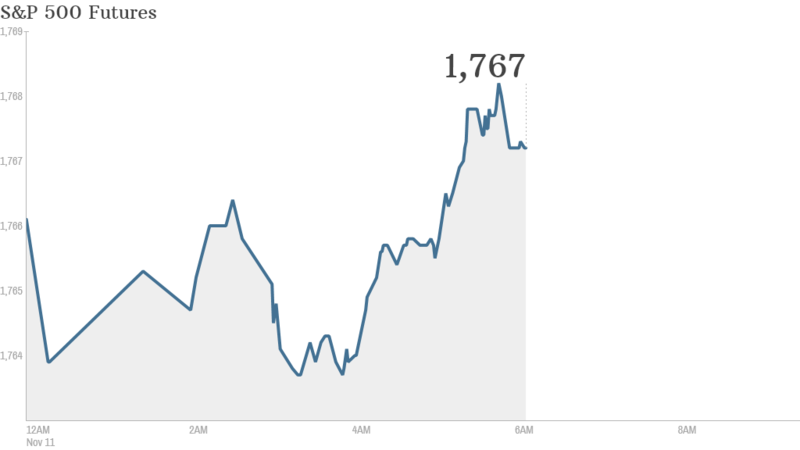 Investors could take a breather Monday after driving the Dow to a new record high last week. With no major corporate results or economic reports on the schedule, and the Treasury market closed for the Veterans Day holiday, stock market trading could be subdued. U.S. stock futures were little changed, pointing to a flat open. "Today, with Veterans' day in the U.S., Armistice Day in Europe and disaster in the Philippines over the weekend, will be quiet," wrote Kit Juckes, strategist for Societe Generale in London, in a market report. U.S. stocks finished higher Friday on the back of a strong monthly jobs report as investors chose to focus on the positive, rather than fret about when the Federal Reserve will start curtailing its stimulus program. Stocks have surged this year thanks to a slowly recovering economy and continued attention by the Federal Reserve. But there are worries about how long the big market run up will last. Investors will be watching for clues about the coming Fed taper when Janet Yellen, vice chair of the Federal Reserve, testifies Thursday at her confirmation hearing on Capitol Hill. She is President Obama's nominee to replace Ben Bernanke as chairman of the Fed. European markets posted narrow gains in morning trading. Asian markets were mixed as Typhoon Haiyan swept through the region. Australia's All Ordinaries Index closed down 0.3%, while Japan's Nikkei rose 1.3% and Hong Kong's Hang Seng gained 1.4%. Online sales on China's "Cyber Monday" smashed last year's record by early afternoon.